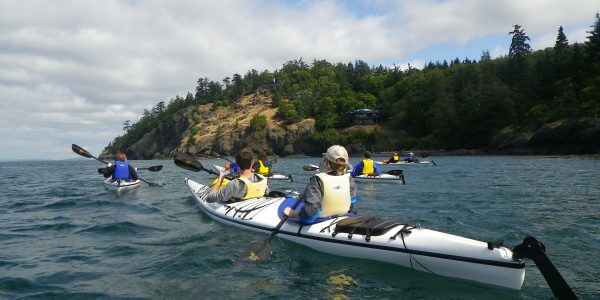 The Half Day Kayak Tour is the most popular San Juan Island kayaking tour. It offers great opportunities for exploring the iconic West side of San Juan Island and whale watching potential. The routes offer excellent wildlife watching and exceptional views of the Olympic Mountains. San Juan Half Day Kayak Tours are great for those looking to get a bit of time on the water kayaking yet still have time for other activities that day. If you prefer this shorter trip you’ll still experience the same amazing west side views as our Full Day tour. We select this route to provide a full San Juan kayak tour experience during our time on the water. What’s the Discovery Sea Kayak difference? 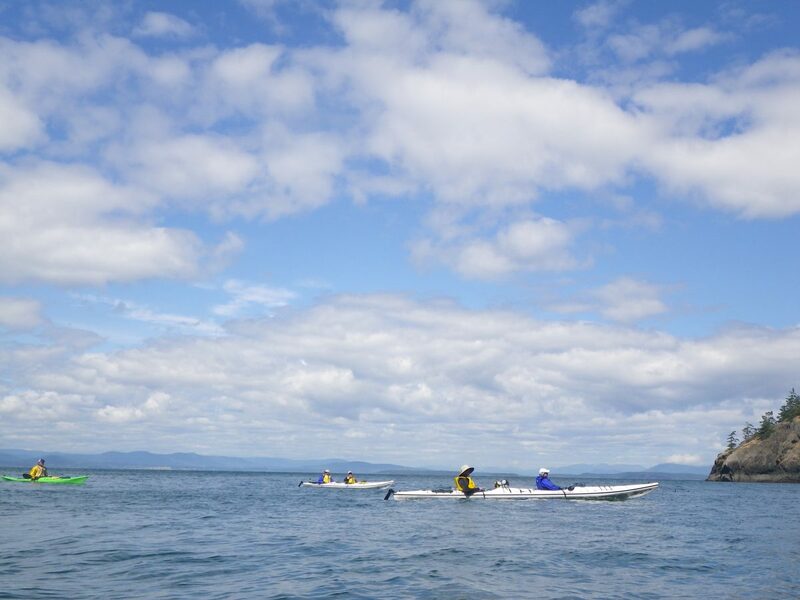 We set ourselves apart by offering the smallest group sizes on San Juan Island, quality kayaking equipment, and professional sea kayak guides. We focus on personalizing your kayak tour experience and reducing our impact as we explore the shoreline. Our staff is educated to provide detailed information about all of the region’s wildlife and history. We train extensively every season to hone our kayaking and leadership skills. We strongly believe in honesty and integrity above all. When you contact us we will always provide you with the most accurate and best information possible about the current kayaking conditions and wildlife sightings. 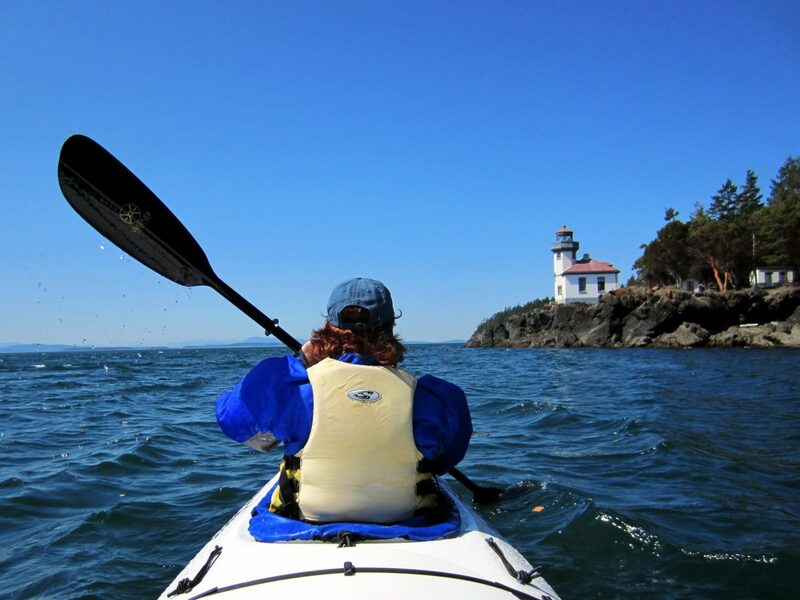 Click photos to view our Half Day San Juan Islands Kayak Tours gallery. This tour was absolutely amazing! One of the best things I’ve done!! We did the half day tour, with Chad as our tour guide. He was SO awesome! We saw SO many Orcas, seals, jellyfish…. You name it, we saw it! I highly recommend this tour for everyone. 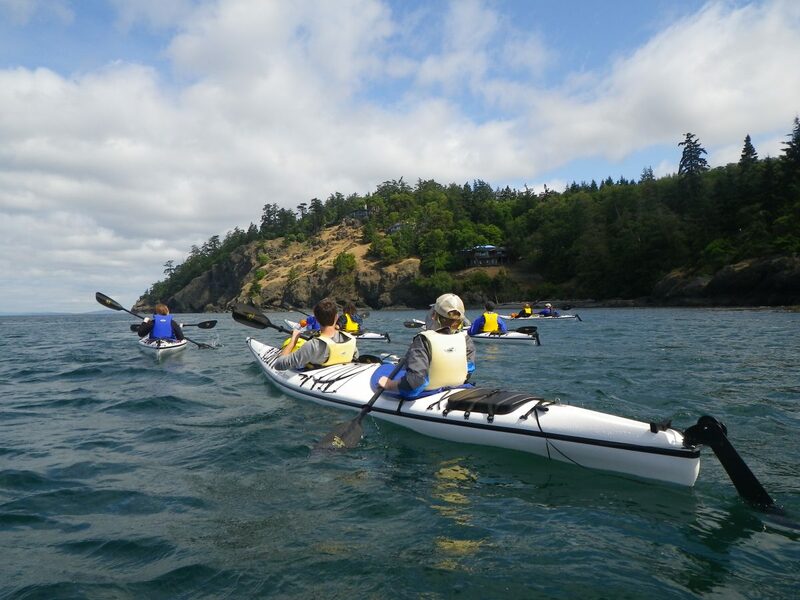 The Half Day Kayak Tour route travels within the heart of whale habitat. 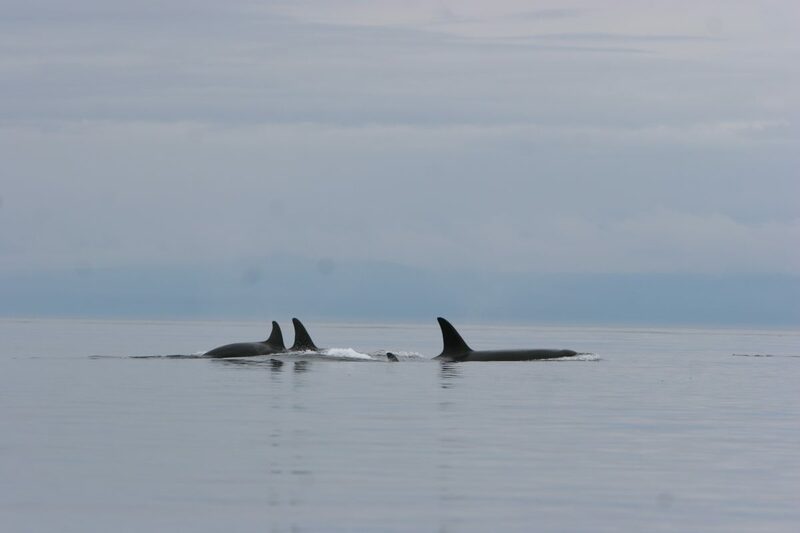 The west side of San Juan Island offers the best opportunity to encounter killer whales. 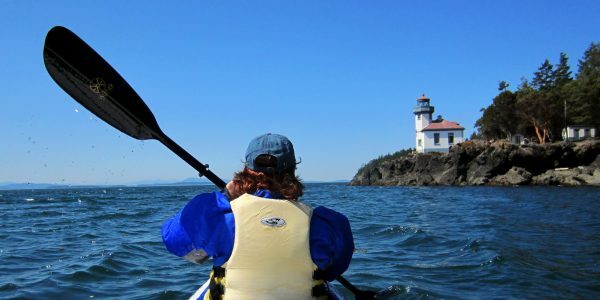 Paddle along the steep bluffs and rocky shorelines near Lime Kiln State Park. This area boasts some of the island’s most spectacular views of the Olympic Mountains and Vancouver Island. Check-in: 15 minutes prior to reserved departure time at our shop, 260 Spring St. Depart Shop: Scenic drive along the west side to San Juan County Park. 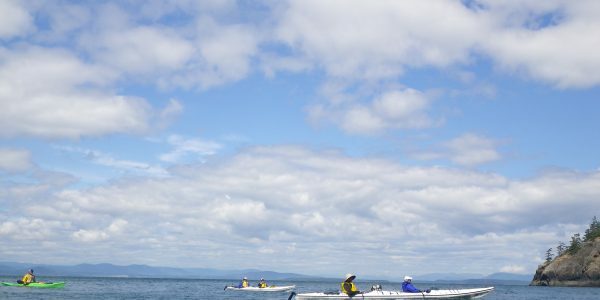 Kayak Orientation: Learn the paddling techniques and safety procedures. Team carry kayaks to the beach. Water Time: Spend the next few hours exploring the western shore of San Juan Island. Trips may be delayed due to orca encounters. Because of regulations in place to protect our local orca whales our movements can be restricted when whales are in the area. Please keep in mind this can affect our return time back to town. We will always do our best to get everyone back in a timely manner. 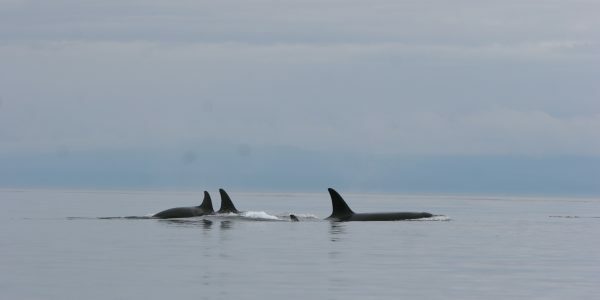 Southern Resident Killer Whales: Salmon eating whales commonly seen June through mid-October. Transient Killer Whales: Marine mammal-eating whales may be seen throughout the year. Baleen Whales: Humpback Whales and Minke Whales. Porpoise: Harbor and Dalls porpoise are encounter year round. River Otters: More elusive but seen any time of year. Most sightings are early morning or late afternoon. Bald Eagles: San Juan hosts a healthy population of Bald Eagles with many nesting sites. Every day is different and we can encounter other species of whales, seals, porpoise, and birds not listed above. Early Season: Spring weather on San Juan is typically cool with daytime temperatures ranging from the low 50’s F to the mid 60’s F. Expect partly cloudy skies with light breezes to windy conditions. Summer Season: San Juan Island can have some of the most pleasant summer weather. With half the annual rainfall of the Seattle area, San Juan is typically dry all summer. Temperatures range from upper 60’s F to the mid 80’s F. Skies are usually blue and clear, great for evening star gazing. Late Season: Fall can be one of the best times to visit San Juan Island. The days become cooler, ranging from the low 50’s F to the mid 60’s F. Winds can be light to moderate depending on the current weather systems.